Despite all the footage we’ve already been treated to in the recent barrage of promotional goodies for Marvel’s The Wolverine 20th Century Fox always seem to have something exclusive waiting right around the corner. 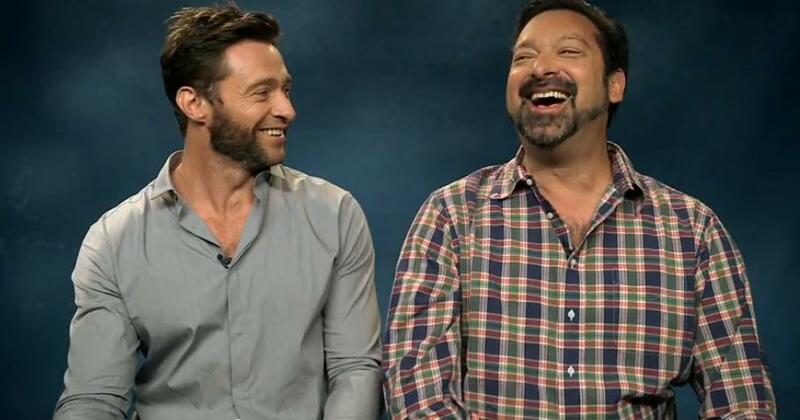 Yesterday HBO Advance Notice released a preview featurette with an unseen scene from the film together with some toing and froing between director, James Mangold and the film’s protagonist, Hugh Jackman as they discuss the focus of The Wolverine. Despite the duo not having worked together since Kate & Leopold back in 2001 it’s clear that the star and director have built up quite the friendship since they first came across each other. With just a few days until the film’s release in the UK here’s said featurette to whet you appetite even more. Most people dread the thought of being caught up in a hostage situation but that’s about to change as Alan Partridge: Alpha Papa is about to hit cinemas this August 7th. 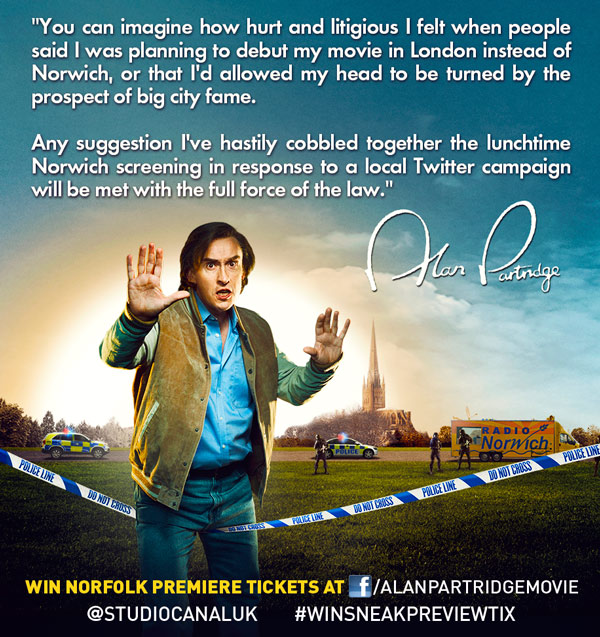 It was only a question of time before a film following the antics of the famous local radio DJ / one time talk show host Alan Partridge was going to hit cinemas but no one expected this – a hostage situation. As Alan’s radio station, North Norfolk Digital, ends up being absorbed in a merger with a new media conglomerate, the station’s staff become increasingly enraged and Alan ultimately finds himself having to work with the police to defuse a potentially violent siege. Audiences are about to find out whether Alan will make a name for himself as a public hero or simply become another footnote in broadcasting history? Directed by Declan Lowney and starring Steve Coogan, Colm Meaney, Sean Pertwee, Felicity Montagu, Simon Greenhall, and Tim Key ALAN PARTRIDGE: ALPHA PAPA takes cinemas hostage on August 7th. N.B. Thanks to Alan and fans alike, the film will receive it’s official world premiere at Anglia Square Norwich on July 24th. You can keep up to date with everything Alpha Papa related over on Facebook and you might also like to check out the recently launched official website for North Norfolk Digital here. The most anticipated pub crawl in history finally begins tomorrow, 19 July, as The World’s End brings its green mint choc-chip flavour to cinemas, bringing the Three Flavours Cornetto Trilogy to its culmination. Given the film’s inclusion at this year’s Comic-Con, with a specific panel this weekend, Peter Jackson — who you may recall put in a cameo appearance in Hot Fuzz — sat down in his stocking feet to chat with Wright and the two leads, Simon Pegg and Nick Frost, after a Wellington premiere of the film. If all 22 minutes of that isn’t enough to keep you happy, three exclusive clips from the film have also been unleashed to give us a really good taste of Wright’s minty new flavour. Head back here tomorrow for the lowdown on what the cast and crew had to say at this year’s Comic-Con panel after which you can head straight down to your local multiplex to watch The World’s End which opens in all of 24 hours time. The soon-to-be-released horror film The Conjuring, from Saw and Insidious director James Wan has created quite the buzz, racking up rave reviews after its debut at this year’s Los Angeles Film Festival. 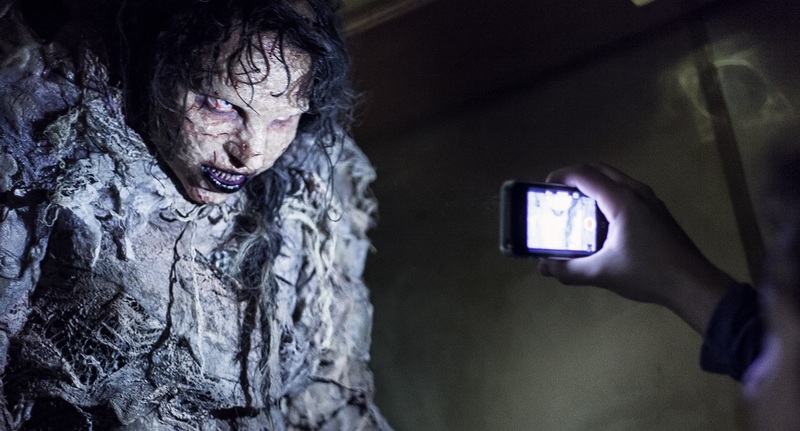 Already being lauded as the most terrifying studio horror film in years, in the quickly growing trend of late, New Line have jumped on the bandwagon confirming that the movie has already been locked for at least a sequel. The Conjuring is based on a case the real life paranormal investigators Ed and Lorraine Warren researched, and New Line’s intention is for the next film to draw on their case files for more juicy material (the pair’s cases already inspired films such as The Amityville Horror and The Haunting in Connecticut), New Line president Toby Emmerich confirmed this stating they had already gained permission from Lorraine Warren to go ahead with a sequel. No news of Wan coming back to direct and it certainly isn’t looking too feasible right now, particularly given his current involvement in Fast and Furious 7, but the original scribes, Carey Hayes and Chad Hayes, are expected to pen the sequel. 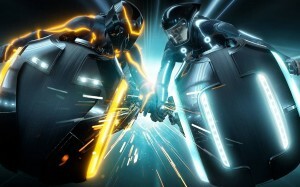 With his work on Oblivion completed, director Joseph Kosinski‘s is all set to take on two more same genre projects: Tron 3 and Disney’s The Black Hole revamp. Kosinski has confirmed that both of these projects are currently in the writing stages with The Black Hole being adapted by Jon Spaihts (Prometheus, The Darkest Hour) whilst, lesser know scribe, Jesse Wigutow, is tackling Tron. Whilst no release date has been announced yet, it is expected that Garrett Hedlund will reprise the lead role as Sam Flynn. Whilst Dumb and Dumber To was swiftly saved by Universal and Red Granite recently, a spanner has been thrown into the works yest again. Production company Red Granite has taken it upon themselves to sue the original Dumb and Dumber producers Steve Stabler and Brad Krevoy to keep them well and truly out of the sequel mix. Why? 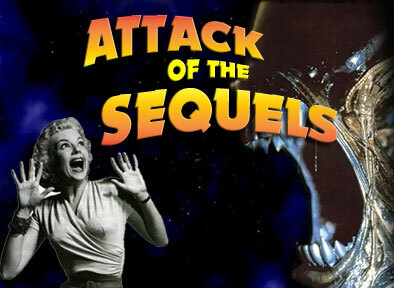 According to the company, Stabler and Krevoy threatened to take legal action unless they were credited as producers for the sequel. Despite the lawsuit, for the moment it looks like pre-production will still commence next week. We’ll keep you informed should these plans change at all. We’ll leave you with a featurette providing an in-depth look at the aforementioned inspiration for The Conjuring, Lorraine Warren, as played by Vera Farmiga in the film. The Conjuring will be scaring UK audiences this August 2nd. Just when you thought we could get any more trailers, clips or featurette videos in relation to the upcoming movie The Wolverine we are introduced to Logan himself along with three other characters from the film, Yukio, Harada and Viper. These introductions come in the form of brief character featurettes which each include footage from the film together with snippets of interviews with the cast and film’s director, James Mangold. The Wolverine invades UK cinemas on the 25th of July. 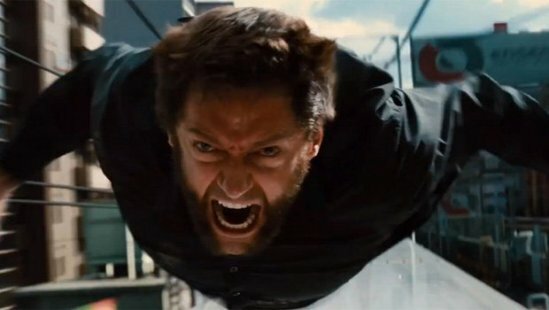 With just a couple of weeks to wait until The Wolverine hits cinemas this 26th of July, 20th Century Fox has released the first full clip from the film providing a taste of the action packed ride audiences are in for. 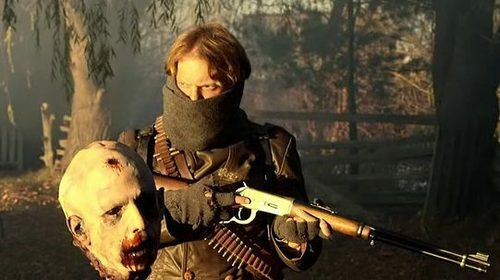 The clip features a scene that has already cropped up in a number of trailers already released: the bullet train fight. The film’s director, James Mangold certainly displayed his firm grip on action choreography direction in the recent Knight and Day so it’s a fair bet we can expect something to parallel or even better Tom Cruise’s death defying stunts. As long as you can leave realism in the foyer as you enter the cinema this could be THE superhero film this year. Enjoy the clip below and let us know what you think in the comments section. 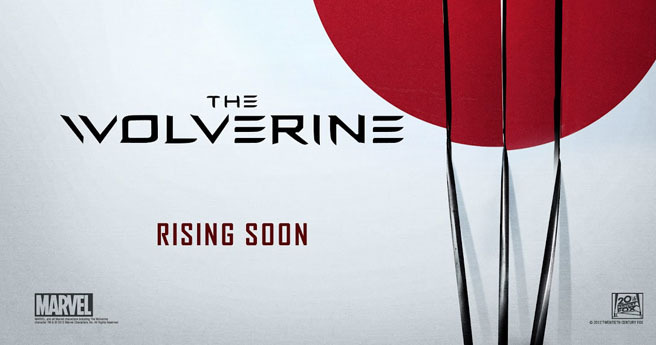 The Wolverine stars Hugh Jackman, Will Yun Lee, Hiroyuki Sanada, Brian Tee, Rila Fukushima, Svetlana Khodchenkova, and Tao Okamoto and opens on the 26th of July. With Dynamo raising eyebrows since his apparition on the magic circuit us Brits are yearning for a healthy dose of abracadabra packed into an action-thriller-heist movie. Now You See Me certainly looks to pack all that into its running time. Under the adept direction of Louis Leterrier (The Transporter, Unleashed), the film follows a quartet of magicians know as The Four Horsemen (Jesse Eisenberg, Isla Fisher, Woody Harrelson, and Dave Franco) who use their mastery of magic to perform their greatest performance to date, transferring a millionaires bank funds into the accounts of members of the audience. Oscar-winning filmmaker Sofia Coppola is back directing, writing and producing somewhat of a genre change for her – the caper film, The Bling Ring, based on the Vanity Fair story “The Suspect Wore Louboutins” by Nancy Jo Sales. Emma Watson has suddenly come of age and, as the trailer shows, we can expect to see her with different eyes as she plunders celebrity homes with her gang of crooks who come to be known as “The Hollywood Hills Burglars,” “The Burglar Bunch,” and “The Bling Ring,” all in the name of finding fame. Despite the film being headed up by an ensemble cast of virtual unknowns, with the exception of the aforementioned Watson, The Bling Ring is sure to be one of our guilty summer season vices. Since his 2009 debut, Down Terrace, Ben Wheatley has quickly clambered up the ladder of indie British filmmakers concocting a new wave pedigree of horror. If you thought Kill List and Sightseers reinvented the mould, the trailer for A Field in England promises an heftier doses of ingenuity as Wheatley forays into the English Civil War. 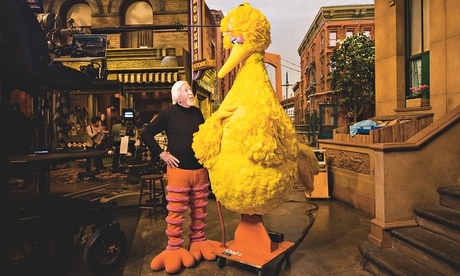 Expect nothing to be done by the book and a film destined to achieve late-night cult screening status for years to come. After thirteen films Pixar are picking up their backpacks and heading back to school with their first ever prequel, Monsters University. 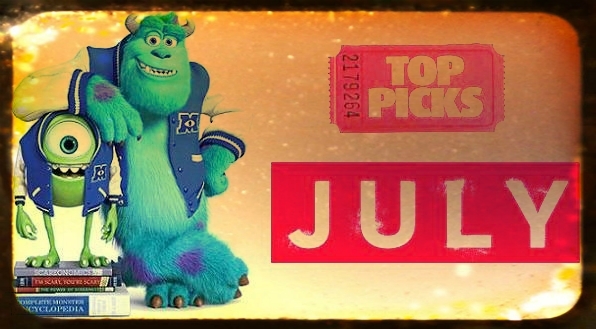 The film follows the antics of Mike Wazowski (voiced by Billy Crystal) and James “Sulley” Sullivan (voice by John Goodman) relating their extremely shaky first encounter as monster fraternities battle it out in the annual Scare Games. Audiences can look forward to more than a few hat tips to cult ‘80s college movies so the film is sure to cater for kids and kidults alike. Since the first footage of Guillermo’s Del Toro‘s Pacific Rim debuted at Comic-Con last year everyone has been waiting with bated breath see giant robots fight it out on the big screen against giant monsters (Kaiju). It certainly sounds like the perfect recipe for a generic summer blockbuster “a la Transformers”, but the promotional goodies haven’t turned sour yet and probably won’t as the release of the film is upon us. Not only that but with plotlines such as the robots being physically linked to the pilots, meaning they share memories, the simple premise becomes much more than brain switch off eye-candy. To cut a story short the film relates how the Kaiju rise out of a dimensional portal in the ocean with the humans building massive robots, known as Jaegers, which require two pilots to fight in perfect synchronisation. If you want eye-candy that comes bundled with a plot that actually provides fodder to chew on this summer then Del Toro serves it up on a platter here. Drake Doremus follows up Douchebag and Like Crazy with Breathe In, a drama which the director had in fact completed photography on before Like Crazy had even hit cinemas. Collaborating once again with the actress Felicity Jones the film also boasts the presence of the acting muscles that are Guy Pearce and Amy Ryan. Whilst Doremus has confirmed the implementation of his semi-improvised filming process used for previous projects, Breathe in is said to implement a more conventional, handheld-free aesthetic, which we can’t wait to experience. Following the first two “Cornetto Trilogy” outings that were Shaun of the Dead and Hot Fuzz the word excited doesn’t even begin to describe how much expectation there is for the final entry, The World’s End. The film follows a group of old friends who decide the time has come to relive an epic pub-crawl from their youth which they do, only something apocalyptic gets in the way. We can’t wait for Barmageddon. Enough said. Alongside Pacific Rim, this is the other biggest blockbuster coming out in the month of July. It’s also the film fans of the comics have been waiting for as this is the first time the series rummages into the character’s comic book roots in Japan. The Wolverine finds Hugh Jackman back for a fifth time as Logan, this time doing battle with ninjas and the yakuza. When Aronofsky pulled out of the project expectations faded but, given the film’s eventual director, James Mangold’s track record including the likes of, Walk The Line, Identity and 3:10 to Yuma the project has been nurtured in safe hands. Yahoo Movies has kindly released a rather special featurette boasting some behind the scenes footage to confirm just how good a director Edgar Wright really is. Even though the previous Cornetto Trilogy films Shaun of the Dead and Hot Fuzz demonstrated his talents it’s always good to hear talent saying how good he is in interviews just to get us even more revved up as we are on the verge of The World’s End. 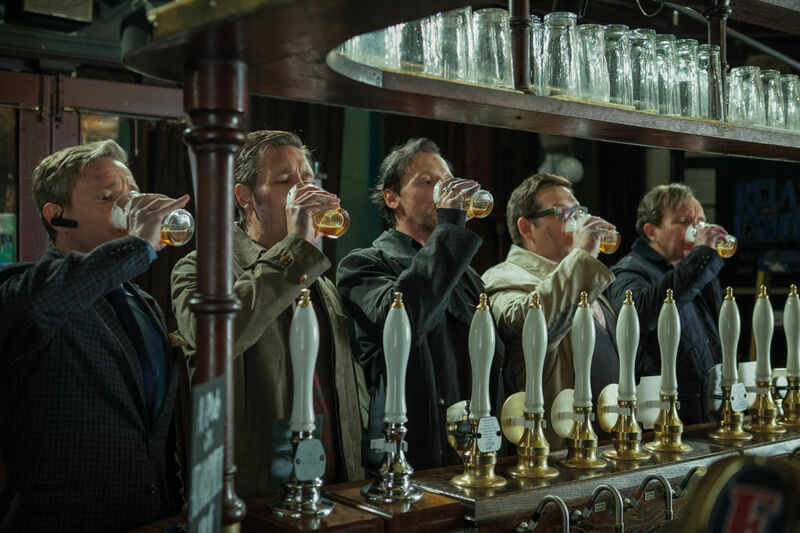 The World’s End opens in UK cinemas on the 9th of July before reaching US shores on the 23rd of August.